Powers/Abilities: The Coal Tiger had the same abilities as his counterpart, the Black Panther. He was a master martial artist and had advanced senses. History: (Avengers I#355) - On an alternate world where Sersi went mad and killed everyone, the Coal Tiger was the last survivor of the Avengers. Proctor sent his minions, the Gatherers, to capture the Coal Tiger in order for Proctor to recruit The Coal Tiger himself as a Gatherer. The Gatherers came to what was left of Avenger's Mansion and found Coal Tiger, whom attacked them. Sloth easily subdued and knocked Coal Tiger unconscious. The Gatherers took the captive Coal Tiger through a portal to their base high in the Andes mountains of Earth-616. However, the shock of the transition had drained Coal Tiger and he seemed incapable of surviving in Earth-616 for very long. In order for the Coal Tiger to survive and join them, the Gatherers tracked down his counterpart in Earth-616, the Black Panther, whom they planned to kill so that the Coal Tiger could live. 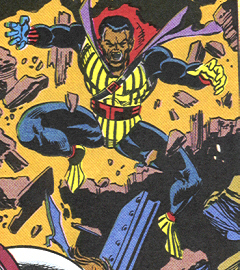 (Avengers I#356) - The Gatherers released the Coal Tiger near warrior falls in Wakanda. When the Black Panther found him and realized that they looked and smelled exactly the same, he was surprised by the Gatherers. The Black Panther was saved by the Avengers, but shocked that he had found someone who appeared to be his exact double. The Coal Tiger eventually regained consciousness and was just as surprised to see the Black Panther as the Panther was to see him. As the Avengers battled against the Gatherers, Coal Tiger tried convinced the Swordsman of the Gatherers that what they were doing was dishonorable and wrong, as it was obvious that the Swordsman had doubts of his own. Before long, the Black Panther was captured, and Cassandra was going to kill him so that the Coal Tiger could live in a ritual called "a gathering." The Coal Tiger exclaimed that he did not want to live at the expense of another, and begged Swordsman to intervene. Coal Tiger was successful in getting through to the Swordsman, who interrupted the Gathering. The Gatherers were chased off by the Avengers and an elite Wakandan strike force, and the Coal Tiger thanked Swordsman as he died for allowing him to die honorably. The Coal Tiger then passed away. Comments: Created by Bob Harras and Steve Epting based on an alternate costume/identity considered for the Black Panther-616 (T'Challa). 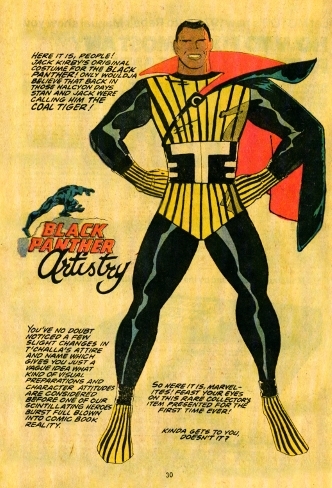 An interesting side note: Coal Tiger was the original name intended for the Black Panther by Jack Kirby.